It happened so quick on the fourth day of the hunt,on a wet day after a good little rain. Walking and stalking was the plan for the morning. It was kinda cool, so I decided to wear my gilli suit for the walk. After about a half hour I noticed the rubber that held my arrow in when I drew back had came unglued from the riser. I'm thinking to myself this is going to be trouble if and when I have to shoot. Well, sure enough it happened. With the early sun coming up to my left I noticed what appeared to be a stump about fifty yards away. I dropped down on both knees and watched. Sure enough it moved and the game was on. Not knowing yet what it was, cow or bull maybe stump and knowing I had a slight problem with equipment, I decided to give a couple of cow calls. Sure enough, not a stump. It got up and I was sure then it was an elk. The animal made one complete turn and layed back down and at that time I was able to see antlers. Heart pumping, I gave a few more cow calls. He got back up and took a few steps towards me face-on, browsing on a small oak. He then decided to turn to my right giving a broadside shot at fifty yards. This is it! I drew back trying to get the arrow onto the launcher and wala, arrow with lumanock stuck in the ground under him. I loaded another arrow and got everything re-alined, drew back and released. Guess what? Arrow with lumanock stuck in tree right above his back. 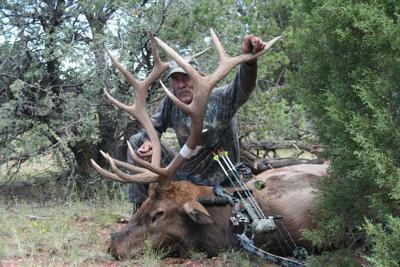 I'm thinking to myself there is no way this bull should be standing there now, but he was and so I loaded another arrow and shot right at fifty yards slightly up hill and was able to finally able to connect. The bull took about four jumping steps and went down. Knowing he was on the ground I just stared in the direction and watched both arrows with orange glows starring back at me in places they shouldn't be. 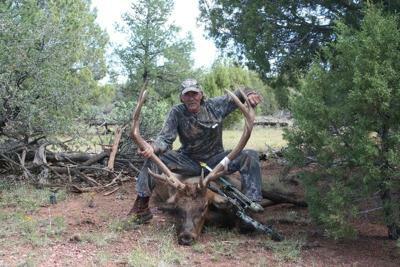 This was a special hunt just turning 60 years old and a special bull. One that I call pretty boy. I guess the moral of my story is to double check your equipment and don't give up! Very good, Dan! Yeah, you don't stop trying to put an opportunity together until it's accomplished, or the opportunity evaporates!